If you want to use the popular STM32 ARM series of microcontrollers but you don’t like using example projects or templates and want to create your development environment from scratch, you are at the correct page. I will explain step by step how to create a project on Eclipse. Here I use my STM32VLdiscovery board, which is the most basic development kit for ST’s STM32F10x series ARM Cortex-M3 (STM32F100RB) chip. Then I create a project on Eclipse equipped with GNU MCU Eclipse environment. Be sure that you have all the steps below in order to start creating the first project. Eclipse CDT (Oxygen) with GNU MCU Eclipse is installed. Follow the instructions on this post. GNU ARM Toolchain (gcc-arm-none-eabi-7-2017-q4-major) provided here. Download STM32F10x standard peripheral library (STM32F10x_StdPeriph_Lib_V3.5.0) here. STM32F10x board to debug (Optional). 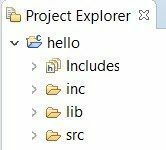 Start Eclipse and go to Project Explorer, then right-click to create a project. Now head to “C++ Project” under “C/C++” section and choose “Empty Project” under “Executable” and write the most creative name you can find for your first project. Click “Next” and “Finish” with both “Debug” and “Release” configurations. Now you can start creating project folder structure. We need “src”, “inc” and “lib” sections and finally the project will look like the following. Lib stands for MCU specific libraries; specifically stdperiph, CMSIS and linker script in this example project. 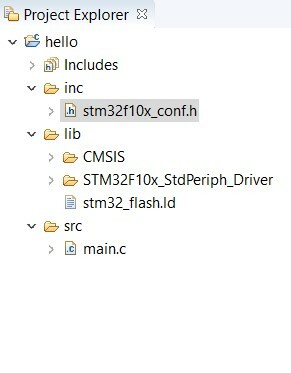 Extract the contents of stdperiph archive and copy everything under “Libraries” folder (CMSIS and STM32F10x_StdPeriph_Driver) into “lib” folder of the project. 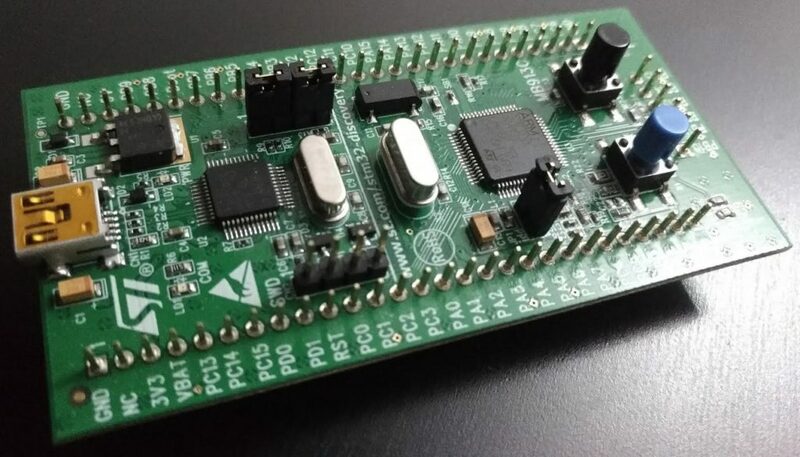 or find another script for another development board that is closer to your needs. We need to create a main function somewhere and obviously the perfect location is a main.c file under src folder of the project. Now we can create a dummy file like the example below. We don’t need to include any headers for the time being. 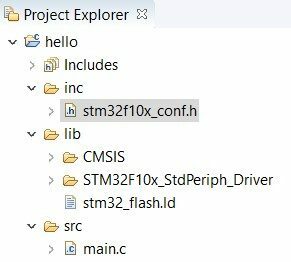 The second mandatory file is a special header file called stm32f10x_conf.h and somebody has already provided one for us under Project/STM32F10x_StdPeriph_Examples/ADC/3ADCs_DMA. Now after we add these two mandatory files into the project structure, be sure that project explorer looks like this. initialization of static values in .data section. execution of initializer functions and/or static constructors in .init_array. 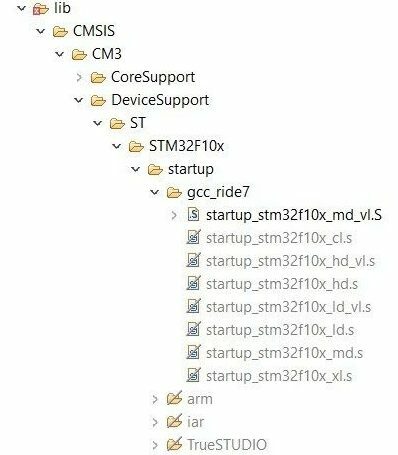 Different compilers are supported in stdperiph and we need to exclude the unnecessary ones: arm, iar and TrueSTUDIO under lib/CMSIS/CM3/DeviceSupport/ST/STM32F10x/startup (for Debug and Release). In gcc_ride7 folder, exclude all expect the startup file for your microcontroller. STM32F100RB is medium-density and value-line. 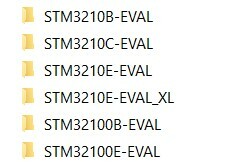 So I excluded all expect startup_stm32f10x_md_vl.s. 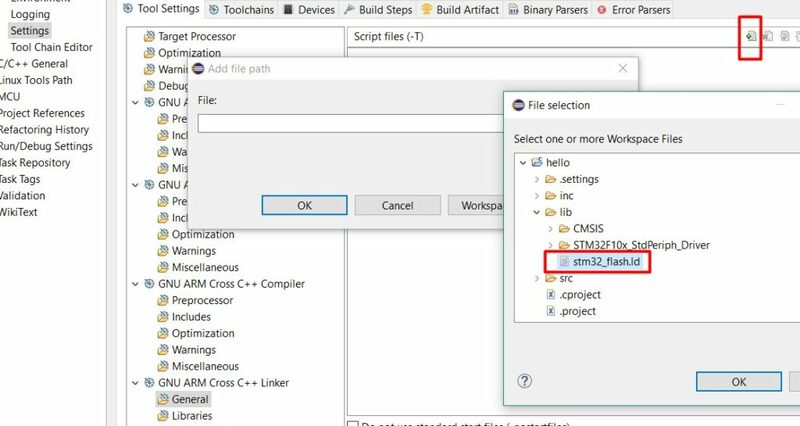 Finally, we need to rename the file to startup_stm32f10x_md_vl.S (uppercase .S or .asm extension) for Eclipse to see it as assembly file. 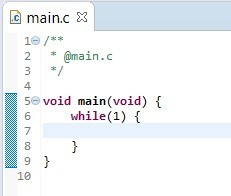 Most of C++ (and some C) projects require one more thing that is missing in the default startup files provided by ST. Static initialization of some classes and class constructors need to copy data to RAM in the startup phase. That process requires a call to __libc_init_array(...) before branching to the user program (and for destructors a call to __libc_fini_array(...) in the end). You should modify your startup file and make sure it looks like the code below. Once the project file structure is ok, we need to do some project settings. Simply go to Propertiesby right-clicking to the project in project explorer, then go to C/C++ Build and Settings. 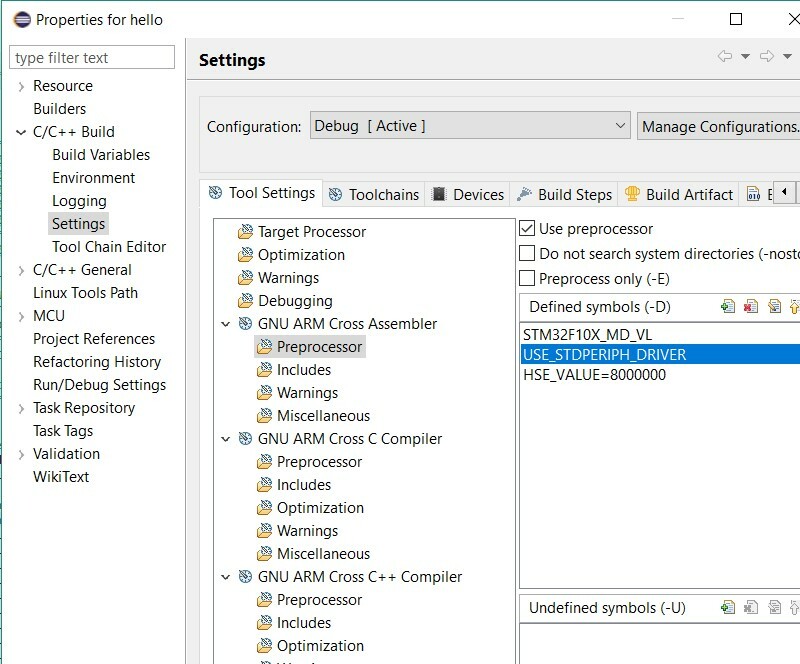 Go to GNU ARM Cross Assembler/Preprocessor and add definitions for STM32F10x_MD_VL (can be different in your application), The crystal oscillator frequency (if any) HSE_VALUE=8000000 and USE_STDPERIPH_DRIVER to enable peripheral library. Add the same definitions to GNU ARM Cross C Compiler and GNU ARM Cross C++ Compiler sections too. 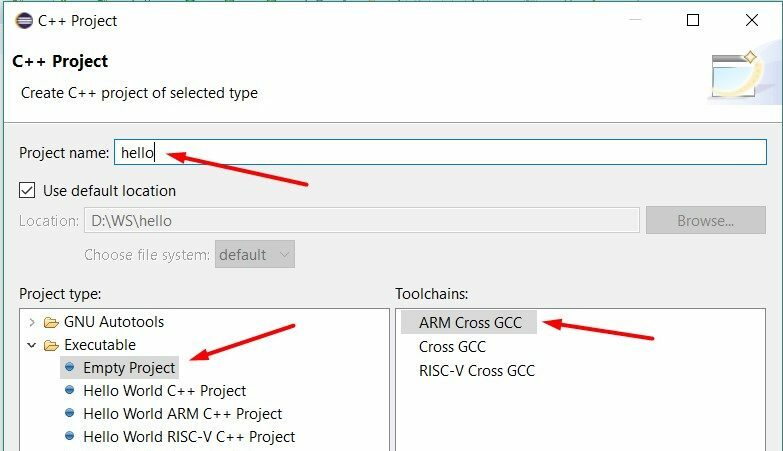 Add the library paths to Includes section of GNU ARM Cross Assembler, GNU ARM Cross C Compiler and GNU ARM Cross C++ Compiler as shown below. Finally it should look like below. To show the linker the path of our script, add its path to GNU ARM Cross C++ Linker/General. Now the project is ready to compile. But when you try to compile, see the following error in core_cm3.c which is a well-known bug of current version of CMSIS. Now you can see the code compiles. 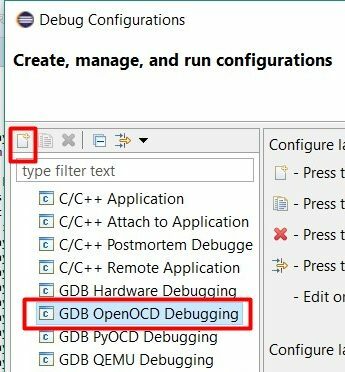 Here is how to enable OpenOCD debugging in your project. 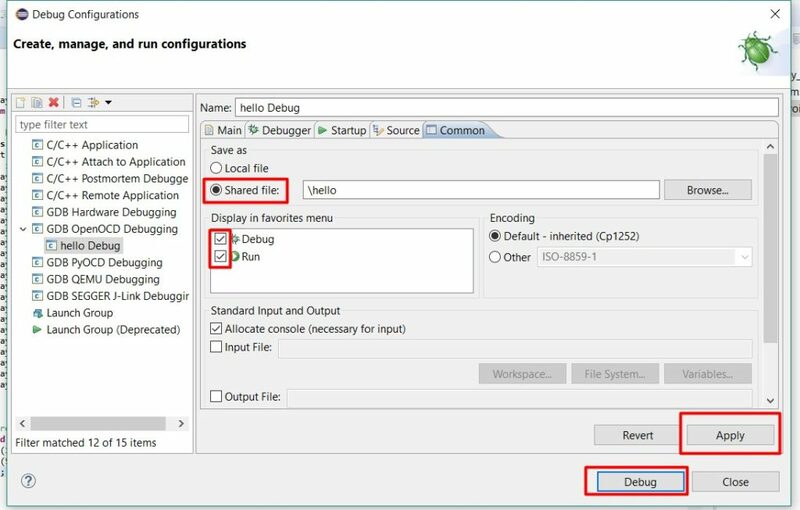 Go to Debug Configurationsand create one. 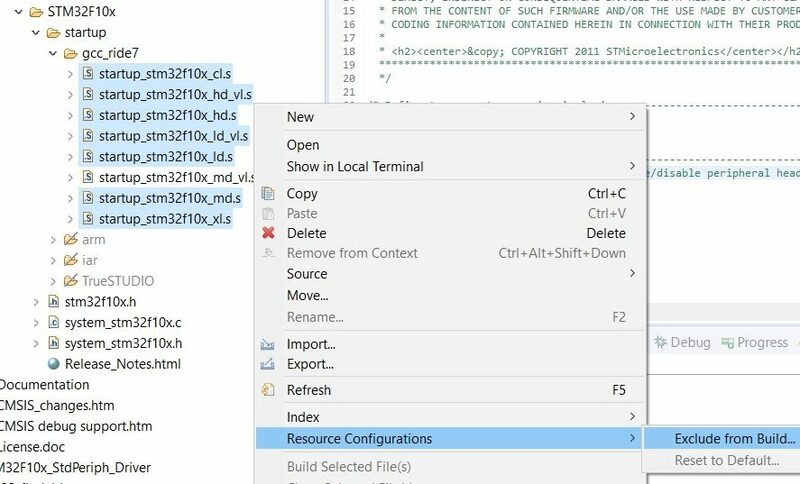 Create a shared file for Debug and Run under Common tab. Finally, install STLink driver from here but this is not enough for OpenOCD to connect. Download Zadig tool and install libusb-win32 driver for STLink. If it is not visible on the list, go to Options, List All Devices. It’s time to see our project in action. Here s a sample main.c file for blinking an LED. 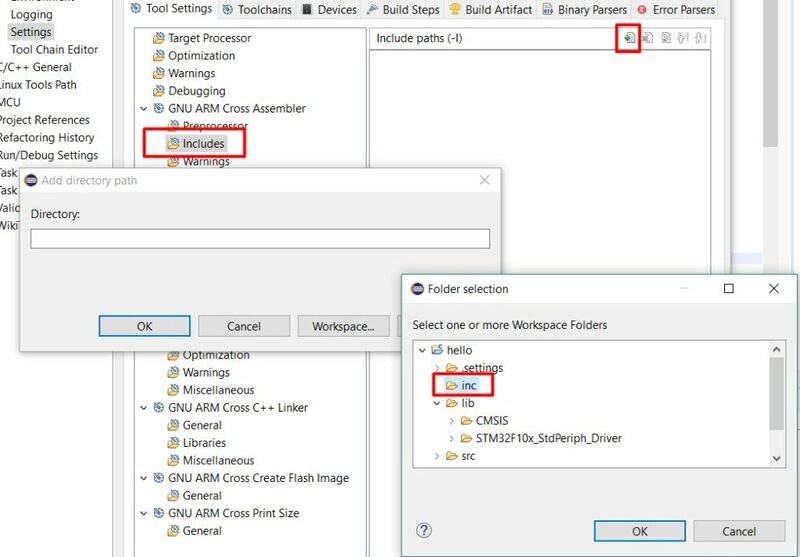 * @brief LED Blinker for "STM32 Project From Scratch on Eclipse" demo. // Configure PC9 output pushpull mode. // Start SysTick at 1Hz. Here we can see that the peripheral library and CMSIS functions can be called from application code. Download link for the created project is also here in case if you have any trouble.